Recently, the importance of balancing building and process energy in manufacturing is growing because both comfortable working environment and energy efficiency have emerged as important element for advancing the manufacturing system. One way of achieving the balance is to optimize the operation of HVAC system (Heating, Ventilating and Air Conditioning System) in such a way that temperatures and states of heating and cooling are optimized. In this chapter, plant energy simulation models are developed by customizing EnergyPlus™ (below written as EnergyPlus) and two new HVAC control approaches such as air conditioning economizer and dynamic mist control are evaluated with the developed energy models. The simulation results reveal that (1) the use of air conditioning economizer can save 8.4 % yearly cooling energy compared to the business-as-usual case without compromising the working quality for a selected example location; (2) the application of dynamic mist control system can save significant cooling and heating energy for machining plants in three selected example locations, at the same time, keeping worker health protection foremost. This chapter also provides a short instruction to EnergyPlus. EnergyPlus was originally developed as a public domain software package to estimate energy consumptions of a building complex. Therefore, its applications are limited to commercial buildings, not industrial facilities. In order to use it for manufacturing facilities, its expansion is required. With an example of a room with welding equipment, the instruction provides step by step guidance toward understanding the details of manufacturing process simulation. 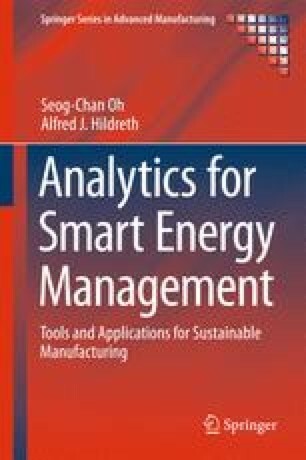 In this chapter, this book uses EnergyPlus to develop and evaluates energy simulation models such as air conditioning economizer and dynamic mist control. Although EnergyPlus is a very powerful tool in modelling and evaluating energy consumptions of a building complex, its applications are limited to commercial buildings, not industrial facilities. In order to use EnergyPlus for manufacturing process simulation, the tool needs to be expanded by adding a new module often, calculating some energy consumption separately independent of EnergyPlus. This chapter illustrates how to expand EnergyPlus for manufacturing process simulation with a single room of welding shop as an example. Note that this chapter is not an introduction to all of EnergyPlus, but to the selected parts of EnergyPlus used in the book. For further instructions, see Getting Started with EnergyPlus, which is available https://energyplus.net/sites/default/files/pdfs_v8.3.0/GettingStarted.pdf. Step 1: Calculate the energy consumption of the manufacturing processes (e.g., welding shop) separately. Step 2: Classify the manufacturing process as one equipment in the building and calculate the effects of the processes on the environment (i.e., dissipation of heat and moisture generation according to the manufacturing schedules). Step 3: Use EnergyPlus to estimate the energy consumption of building pertaining to the building information (e.g., envelopes, windows, and etc. ), regional climate conditions and effects of set points and schedules. Step 4: Combine the two parts of energy consumption calculation to obtain the total energy consumption of the manufacturing shop. Assuming that parts are welded in a single room which configuration is defined in Fig. 7.19. It is of interest to estimate the energy consumption of the welding process and the building. In the equation above (Roelant et al. 2004), Nweld is the number of welders in the shop; Pidle is the power per welder when it is idle, Eps is the average energy consumption per spot (J/spot); Nspot is the total number of spots; and the production rate is in job/h. Pweld multiplied by the total uptime is the energy consumption of the welding process. This example uses welding parameters as listed in Table 7.5. From the parametric energy model for welding process based on the values stated in Table 7.5, the total power for welding process is calculated to 1.3 kW (=1 × 300 W + 1000 J/Spot × 180 Spots/Job × 20 Jobs/h/3600 s). Note that 1.3 kW will be used to integrate the welding manufacturing process into the building configuration by adding an object instanced from ElectricEquipment class as follows (note that the design level of the object is set to 1.3 kW). Note that an error message pops up if (Fraction Latent + Fraction Radiant + Fraction Lost) is greater than 1.0. More details, Fraction Latent is used to characterize the amount of latent heat given off by electric equipment in a zone. The number specified in the input field is multiplied by the total energy consumption by the electric equipment to calculate the amount of latent energy produced by the electric equipment. This energy ultimately affects the moisture balance inside the zone. Meanwhile, Fraction Radiant is used to characterize the amount of long-wave radiant heat being given off by the electric equipment in the zone. The number specified in the input field is multiplied by the total energy consumption by the electric equipment to estimate the amount of long wavelength radiation gain from the electric equipment into the zone. The third heat type, Fraction Lost is used to characterize the amount of “lost” heat being given off by the electric equipment in the zone. The number specified in the input field is multiplied by the total energy consumption by the electric equipment to calculate the amount of heat that is lost and therefore does not affect the zone energy balances. This might correspond to the electrical energy converted to mechanical work or heat that is vented to the atmosphere. The fourth heat type, Fraction Convected is used to characterize the heat contributing to zone loads directly by welders. Similarly, it is calculated by multiplying the total energy consumption by the electric equipment and the Fraction Convected [or 1.0 − (Fraction Latent + Fraction Radiant + Fraction Lost)]. Apparently, these types of heat energy are important elements that affect the energy flow in the room, and further the overall energy consumption in addition to the energy consumed by welders themselves. Other inputs for EnergyPlus are listed in Tables 7.6, 7.7, 7.8, 7.9, 7.10 and 7.11. IDF Editor: edits input files for EnergyPlus. Through EP-Launch, mainly users can (1) access EnergyPlus documentation and (2) invoke IDF Editor and (3) select weather files and (4) view output files and (5) run EnergyPlus. With IDF Editor, users can create and edit input files for EnergyPlus. In detail, users can select object types from class list and add/delete/edit objects. The appearance of EP-Launch and IDF Editor is shown in Fig. 7.21. EnergyPlus is a validated powerful tool. If people want to add manufacturing modules to EnergyPlus, they can avoid reinventing the wheels but only focus on modeling manufacturing process and the integration. Indeed, EnergyPlus can be easily expanded to include energy consumption of manufacturing processes by modifying input files. The first step is to build a model using IDF Editor. This example borrows the building envelope of the training course in Getting Started with EnergyPlus, Exercise 1 (https://energyplus.net/sites/default/files/pdfs_v8.3.0/GettingStarted.pdf) where a rectangular single storey building with windows in east and west walls is defined. The zone is single with no interior partitions. The overall building structure is shown in Fig. 7.19 but the details of the building construction and operation can be found in the tables and description of the EnergyPlus tutorial. For tutorial purposes, the building is located in Chicago Illinois, one of the weather files supplied with EnergyPlus. In order to build the example building envelop, the reader should follow the procedure as stated in Exercise 1A and 1B. Once the step of modeling the building envelop following the EnergyPlus tutorial is completed, the next step is to learn how to add schedules, internal loads, and report variables. Save the resultant IDF file in the previous step as WeldingShop.idf in one of working directory of the reader computer. Add a ScheduleTypeLimits object named “On/Off”. This object is used to specify the scheduler for welder, workers and light loads. The added object, “On/Off” is read in the IDF file as follows. Add a Schedule:Compact object named “Welding Schedule” to schedule the welding shop. The added object, “Welding Schedule” is read in the IDF file as follows. Add an ElectricEquipment object named “Welder” to represent the welding shop aforementioned. The added object, “Welder” is read in the IDF file as follows. Note that the design level of the object is set to 1.3 kW which was calculated from the welding energy parametric model previously. Add a Schedule:Compact object named “Lighting Schedule” according to Table 7.8 to schedule the lighting of the welding shop. The added object, “Lighting Schedule” is read in the IDF file as follows. Add a Light object named “Zone One Light” according to Table 7.7 to schedule the lighting of the welding shop. The added object, “Zone One Light” is read in the IDF file as follows. Add a Schedule:Compact object named “Worker Schedule” according to Table 7.10 to schedule the workers’ activity of the welding shop. The added object, “Worker Schedule” is read in the IDF file as follows. Add a Schedule:Compact object named “Activity Schedule” according to Table 7.9 to schedule the workers’ activity of the welding shop together with “Worker Schedule”. The added object, “Activity Schedule” is read in the IDF file as follows. Add a People object named “Welding Worker” according to Table 7.9 to schedule the workers’ activity of the welding shop. The added object, “Welding Worker” is read in the IDF file as follows. Add a Schedule:Compact object named “Heating Temperature Setpoint” according to Table 7.11 to program the thermostat of the welding shop. The added object, “Heating Temperature Setpoint” is read in the IDF file as follows. Add a Schedule:Compact object named “Cooling Temperature Setpoint” according to Table 7.11 to program the thermostat of the welding shop. The added object, “Cooling Temperature Setpoint” is read in the IDF file as follows. EnergyPlus provides a way to develop custom control and modeling routines for EnergyPlus models. EMS (Energy Management System) is an advanced feature of EnergyPlus and is not for beginners. Nonetheless, it would be still doable for a beginner to come up with a control by following steps set forth in Fig. 7.22. This section will explain each step in Fig. 7.22. In this example, the air infiltration rate (i.e., the unintentional or accidental introduction of outside air into a building, typically through cracks in the building envelope and through use of doors for passage) is set to 0.2 m3/s. If the ventilation works and it intentionally takes outdoor air in, the air flow rate is set to 7.5 m3/s in this example. Add a ZoneInfiltration:DesignFlowRate object named “Infiltration” with the design flow rate set to 0.2 m3/s. The added object, “Infiltration” is read in the IDF file as follows. Add a ZoneVentilation:DesignFlowRate object named “Ventilation” with the design flow rate set to 7.5 m3/s. Make sure that the ventilation type is set to “balanced” so that fans for air intake and exhausting are both working. The added object, “Ventilation” is read in the IDF file as follows. Add a EnergyManagementSystem:Sensor object named “H_in” to read the value of metering data, Zone Air Relative Humidity in the EMS program. The added object, “H_in” is read in the IDF file as follows. Add a EnergyManagementSystem:Actuator object named “Ventilation_Intake” to read the value of metering data, Zone Air Relative Humidity in the EMS program. The added object, “Ventilation_Intake” is read in the IDF file as follows. Add a EnergyManagementSystem:GlobalVariable object named “N_Ventilation_Intake” to count the number of ventilation operation to take air in. This is a global variable and used in the EMS program. The added object, “N_Ventilation_Intake” is read in the IDF file as follows. Add a EnergyManagementSystem:Program object named “Dynamic_Ventilation” to implement the control logic set forth previously. The added object, “Dynamic_Ventilation” is read in the IDF file as follows. Pay attention to how those sensor (H_in), actuator(Ventilation_Intake) and global variable (N_Ventilation_Intake) objects that are created in the previous steps are used in the program. Add a EnergyManagementSystem:ProgramCallingManager object named “Dynamic_Ventilation_Calling” to schedule when to call “Dynamic_Ventilation” EMS program. The added object, “Dynamic_Ventilation_Calling” is read in the IDF file as follows. Add a EnergyManagementSystem:OutputVariable object named “EMS_N_Ventilation_Intake” to report the total occurrence of ventilation operation to take air in after “Dynamic_Ventilation” EMS program runs. The added object, “EMS_N_Ventilation_Intake” is read in the IDF file as follows. Add a new Output:Variable object to report “EMS_N_Ventilation_Intake”. The added object is to be read as follows. Add a new Output:Variable object to report the welding shop electric energy consumption. The added object is to be read as follows. Add more Output:Variable objects as desired. Save and close the IDF file. Run the simulation and review outputs. Check the err file. Find the variables output in the csv file. The resultant energy consumption profile can be graphed as in Fig. 7.23. Note that this example assumes that the building is located in Chicago Illinois. Figure 7.23 shows that the welding shop needs more heating energy during the winter, meanwhile, more cooling energy during the summer. The energy for welding process itself is relatively steady. Remind that it is one example for a room with welding shop. The procedure laid out in this example, however, can be duplicated to other applications. In principle, an entire assembly plant can be modelled using the proposed approach.